Make sure you haven’t got these potentially very dangerous frozen vegetables stowed in your freezer. “Food Standards Australia New Zealand confirmed a precautionary recall is underway of about ten frozen vegetable products due to the possible presence of listeria,” The Age reports. Products sold at Woolworths, ALDI, IGA, Campbell’s and independent grocery stores have all made the list, with those supermarkets already removing suspect products. Essentials snap frozen mixed veg 1kg: Carrots, peas, corn, green beans and potatoes – Distributed nationally with best before dates 19 March 2020 through to 24 April 2020. 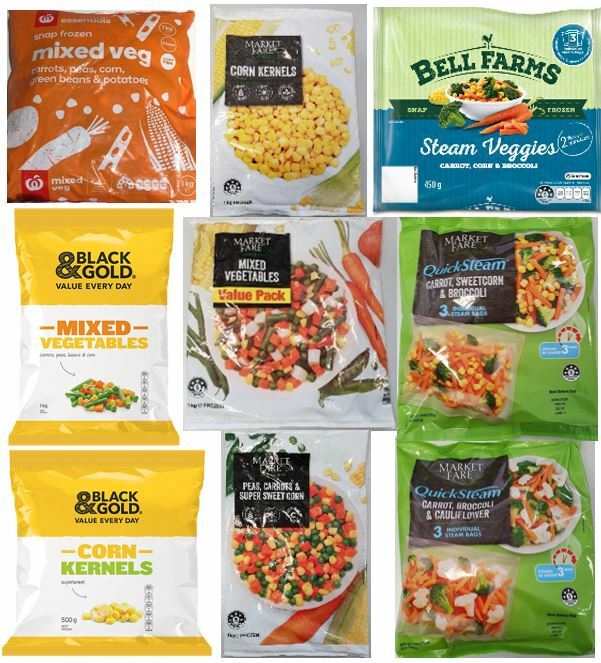 Bell Farms Steam Veggie Carrot Corn and Broccoli 3pk 450g – Distributed nationally, all stock is recalled. Black & Gold Corn Kernels 500g – Distributed nationally. All best before dates are recalled. Black & Gold Mixed Vegetables 1kg: Carrots, peas, beans and corn – Distributed nationally. All best before dates are recalled. ALDI Market Fare Peas, Carrots and Super Sweet Corn 1kg – Distributed nationally. ALDI Market Fare Corn Kernels 1kg – Product of Hungary – Distributed in QLD, VIC, WA and select NSW stores. ALDI Market Fare Mixed Vegetables 1kg – Packed in Belgium from imported and Belgian ingredients – Distributed in QLD, NSW, ACT and WA. ALDI Market Fare Quick Steam Carrot Broccoli and Cauliflower 450g – Distributed nationally. ALDI Market Fare Quick Steam Carrot Corn and Broccoli 450g – Distributed nationally. Food Standards Australia New Zealand also reminded consumers that they should always cook frozen vegetables completely to guard against food poisoning. This recall, which is due to listeria, can have very serious health implications for pregnant women and their unborn babies, the elderly and people with low immune systems. First signs of listeriosis can present as flu-like symptoms such as fever, chills, muscle aches, nausea and diarrhoea – and can then develop into further complications. Woolworths 1800 103 515 , ALDI 1800 709 993, Metcash 1300 135 690.